Formed in 2002, the Allen Parks Foundation is a charitable organization whose primary purpose is to further enhance Allen’s great park system and recreation facilities, expand development of parks and recreational programming, and accept land bequests and other donations by partnering with the City of Allen, other governmental partners, local organizations and groups. The Allen Parks Foundation supports and improves the recreational opportunities in the Park system which enhances the community and the citizens’ quality of life. 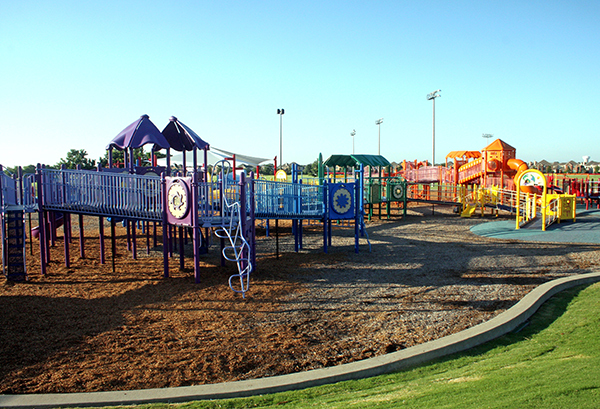 Allen Parks Foundation’s founding project was “kidMania”, the largest handicap-accessible playground in the State of Texas located in Celebration Park. A local group of volunteers came together to create the “kidMania” project and subsequently formed the Allen Parks Foundation in order to plan, fund and build the playground. The Parks Foundation raised over $150,000 for this project and also coordinated the community-build aspect of this massive playground. “kidMania” was the perfect project to start the Parks Foundation and set the tone for the growth of the organization. Since that time, the Parks Foundation has raised private funds for a wide variety of park and recreation projects including additional playground amenities in various parks, park benches, memorial donations, trail distance markers and trail wayfinding signs. Another main goal of the Parks Foundation is to provide ways for directly engaging the citizens of Allen in their parks system. This goal is currently being accomplished in several ways. A “Tool Trailer” was purchased by the Parks Foundation which is loaded with landscape maintenance tools and can be used by any local organization for the enhancement of public spaces. The Parks Foundation also hosts a “rolling” Movie Night in the Park where a family movie is shown in different neighborhood parks, allowing the citizens to experience a movie in a way they never have before. In addition, a “Park Ambassador” program was created by the Parks Foundation whereby citizens can take an active, knowledgeable role in their parks.